The size of the area is to be determined by the players ability and experience. In this example the area would be 12 x 12yds. The better the technique the more challenging it would be in a smaller area. 9 players divided into 3 teams. 1 team is always defending while the other 2 teams work together to keep possesion. Any player on the outside can start with the ball. The players not in the middle must stay on the outside of the area and can switch positions if the opportunity arises. One side of the area will have 2 players. These 2 players can not pass to each other on the same side. Passes can only be made through the playing area. Always inside of the corners. When the defenders win the ball, they must dribble the ball out of the grid but not to the side with 2 players. 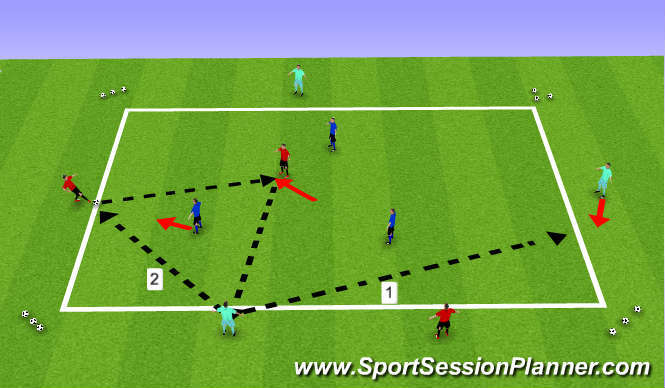 The defenders can also make 3 quick passes to one another, but the player who gave the ball away can jump into the middle area to defend against these passes. Once the defending wins possession, they would changeover with the attacking team who lost possession. The defending team would always start with their players on the outside. The attacking team who did not lose possession has 1 player in the middle among the defenders. Surface of the foot - to make contact to deliver...driven, lofted, bent etc..
Connect passes, but move the ball as fast as possible within the players ability without losing possession. Players supporting the player on the ball to &apos;get into a position where they can receive the ball at their feet without it being intercepted&apos;.